Infiniti is planning a new activation around its NCAA marketing with an event that will benefit the American Cancer Society. During the 2019 season, Infiniti is donating a total of $1 million to Coaches vs. Cancer, a nationwide collaboration between the American Cancer Society and the National Association of Basketball Coaches. Almost two-thirds of that total -- $600,000 -- will be donated in the names of three 48 NCAA Division I men’s basketball coaches. Between Jan. 14 and March 11, 48 of those coaches will compete for fan votes to win the highest percentage -- $360,000 worth -- of that $600,000 Infiniti will donate in their names. The Infiniti Timeout campaign will be promoted on TV, digital, and Infiniti social channels as well as amplified through partner channels. There are two spots from Crispin Porter Bogusky airing on ESPN, CBS, and Turner throughout the season and tournament featuring North Carolina Tar Heels Basketball Coach Roy Williams. 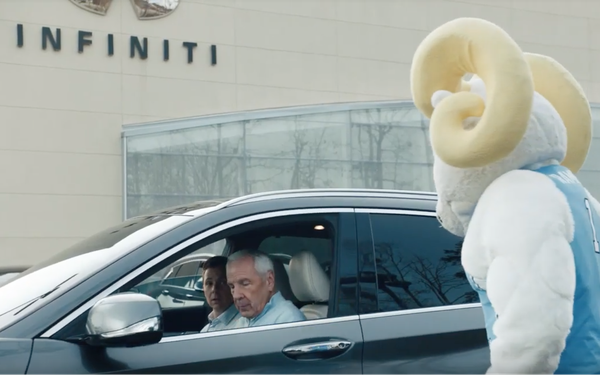 In one humorous 30-second spot, Coach Williams brings a friend — his team’s mascot — into the dealership for a test drive. In another spot, the mascot yields to the coach, who wants to drive the car instead of him. “College basketball fans are among the most passionate in sports, and this gives us the opportunity to engage fans and keep Infiniti top of mind from January through early April,” Phil O’Connor, director, Infiniti marketing communications and media, tells Marketing Daily. The competition harnesses the competitive nature of fans, schools and coaches so that, regardless of their biggest on-court rivals, everyone comes together in the fight against cancer. Throughout the two months, fans will determine the winner by voting at www.infinititimeout.com. Fans can also cast additional votes on social media by posting a photo of them taking a timeout and including #TIMEOUTFTW with their coach’s social handle or the hashtag: #CoachFirstNameLastName. As of Thursday afternoon, there were already a multitude of posts from fans and the coaches themselves on social media using the hashtag. The challenge is being promoted across ESPN digital and broadcast networks including ESPN, ESPN2, ESPN.com and several social media platforms. This is the luxury automaker’s ninth year in partnership with the NABC, NCAA and ESPN.